Distance: approx 1.9km on a mixture of road, tracks, gravel and grass. The route has a variety of inclines and descents. Description: The race requires pace judgment and is physically testing in places. 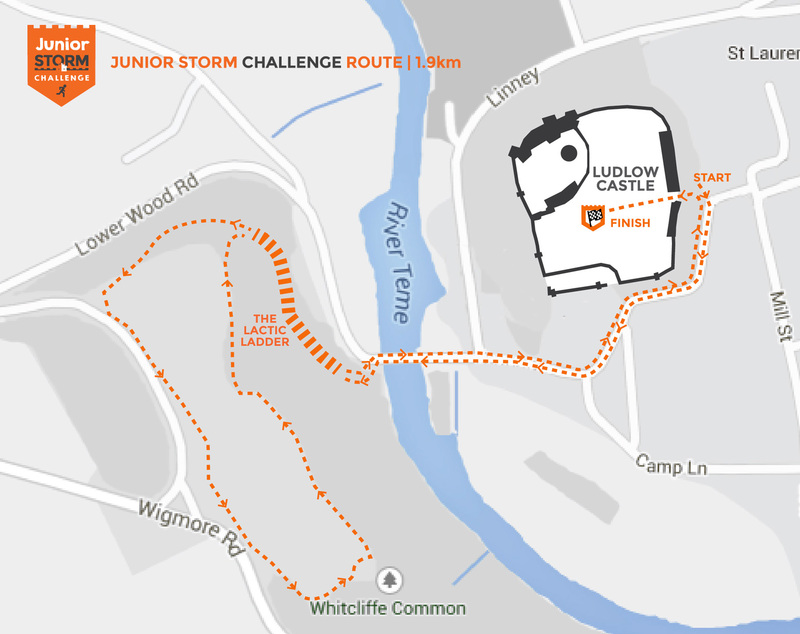 Runners begin outside the iconic Ludlow Castle and will be directed along Dinham, where a quick descent takes them to Dinham Bridge. After crossing the bridge they will quickly be confronted with the ‘Lactic Ladder’ with its double stage uncompromising steps. They then continue on soft tracks and paths until entering Whitcliffe Common and completing a loop of the common. They now begin to head for the finish including a descent of the ‘Lactic Ladder’, back across Dinham Bridge and the final climb up for ‘The Wall’, a short but steep and aggressive climb and then just when you think it’s over the final 150 m sprint begins towards the castle entrance and into the grounds to Storm The Castle! Start Time: approx 12.20pm. This race will begin once all of the Junior Storm Dash runners have finished. Prizes: Trophies will be awarded to the 1st, 2nd and 3rd boys and girls. All runners will receive a special Junior Storm medal. There will also be a trophy awarded for the best attended school in this race. PLEASE NOTE – ENTRIES IN ADVANCE ONLY, NO ENTRIES PERMITTED ON THE DAY. Entries to be submitted online.